Prelude	is simply the most legendary coupe from Honda. Though it would be an exaggerating statement but it is true. A great history that kicked off in 1978, Prelude went on to get better and better on road. With 5 great versions of this model, its production was finally halted in 2001. It created vibes in 1988 when the 2.0l was launched for the first time. A massive 142 bhp was something to praise for at that time. Though the bonnet was long and sleek but it tapered at the end so that the driver had a good road view. Subsequent models of the ’90s had their own pros and cons. 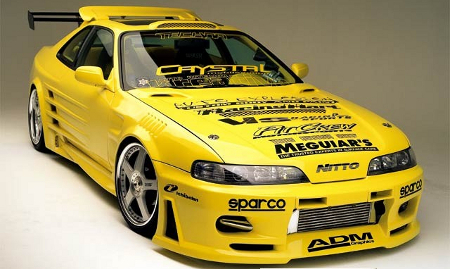 One of the most inspiring tuning of the 92-96 Honda Prelude was seen recently. A metallic Navy blue was modified with flawless fittings. A lowered adjustable suspension setup using Koni Sport dampers matched to Eibach Pro progressive Spring Kit was the biggest attraction. New alloys of 17″ OZ Superleggera fitted with Toyo T1-R tyres have boosted its road grip. With such a great model, you need to take care of the exhaust system. It should match the dark cat body and it would be better if it is made of pure stainless steel. A 60-70 mm decat pipe would help the cause. Thinking of the intake it is advisable to use Prelude Type-S airbox and a K&N air filter. It obviously needs Shell V Power 99 Octane fuel with NGK iridium plugs. Finally the H22A2 boost would be the best configuration that you would add up your Prelude. A new motor with raised rev limiter upto 8500 rpm and an altered time map for compatibility purpose are added assets. If you are still obsessed with more amazing looks, then you can go for a set of 16-inch Mugen MF 8s from Auto Salon. With such a heavy configuration, you need to keep the water temperature gauges working really well. 1996 Honda Prelude Si is one of the rarest models you woud see around these days but rural Tennessee is one such place where you’ll find America’s hottest Prelude. Built on a firm JDM parts’ base, the clean finish and final touches are amazing. A turbo-charged ITR boosts up the performance to a whole new level. A H23 block with a H22 parts and an intake manifold pulled off for better brake lines are some of the astounding and unique features of this tuned up beast. Prelude’s suspension could become a concern with heavy tuned up configuration. Hence for a piece of advice, always go for an original Honda suspension or you could lose the charm of every single configuration done till now. In a nutshell, Prelude is rare as a Panda; yet when it unfolds its elegance after years; it is worth a Nostalgia for many more years to come.